With winter descending and the holiday season in full swing, the spirit of generosity and compassion is all around us. Charitable giving is up, and bursting out into song is considered perfectly acceptable. With so much joy and warmth in the air, it can be disheartening to see that these feelings do not always extend to the fur-bearing animals that suffer and die to serve as winter fashion accessories. This holiday season, we have the power to change that by deciding not to buy animal fur, and by giving our business to companies that do the same. The fur industry knows that most people do care about animal welfare, and don't want products derived from suffering. That's why its public relations experts have been waging a campaign for years to confuse the public about the truth behind fur. 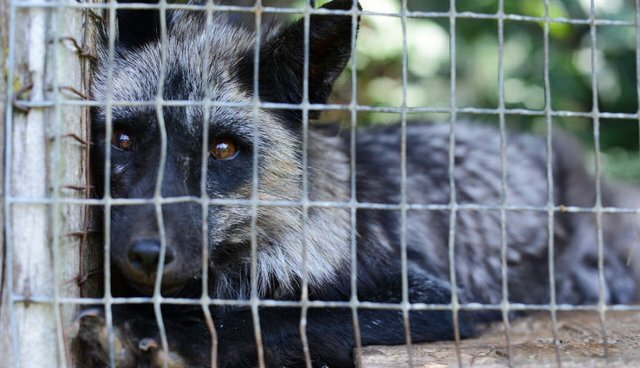 It uses vague, misleading terms such as "responsibly raised", "certified", or "ethically sourced", and one company even goes so far as to say its fur comes from "happy animals". Bizarrely, some advertisements even show models dressed in fur posing next to huskies who don't look all that different than the coyotes killed to make the coat in the photo. In the face of all this obfuscation and slick advertising, it's easy to understand why some consider it justifiable to purchase fur-trimmed garments. This is why the fur industry hopes you never Google terms such as "fur farm investigation" or "coyote in trap." If you did, you'd be able to see for yourself that this industry is inhumane, irresponsible, poorly regulated and ultimately unnecessary. You'd see that animals caught in traps suffer for hours or even days, terrified, alone and in pain until the trapper finally returns and kills them. You'd find out that up to two-thirds of the animals caught in these traps are non-target species, including dogs, cats and endangered species. You'd see images of minks and foxes in tiny cages, suffering both physically and psychologically because they're neglected and prevented from engaging in their most basic natural behaviours. You'd learn that their miserable lives are usually cut short by gassing, neck breaking or electrocution. Despite industry claims to the contrary, you would also learn that fur farming and fur processing are extremely damaging to the environment, leaking waste and toxic chemicals into our soil, water and air. If you dig deep enough, you may also discover that the Canadian government (along with some provincial governments) is using taxpayer dollars to help fund this inhumane, environmentally damaging industry, and to subsidize the misleading advertising and labeling that hides the truth from the public. And the truth is getting harder and harder to obscure as the inherent cruelty of this industry is exposed. What we're seeing is the emergence of a humane economy, where people expect more than quality – they expect a product that does not rely upon the suffering and exploitation of another living creature. Be they industry executives, marketing experts, or trappers and fur farmers, no one can prevent you from seeing the truth, nor can they stop you from acting on it. Let's tap into the compassion and love that surrounds us during the holidays, and extend it to the tens of millions of animals suffering and dying for products that nobody needs. Let's write to retailers and designers to tell them that we won't buy any animal fur, and that we'd be far more likely to give our business to fur-free stores and products. It's easy enough to do, and it's a simple action that promotes a more compassionate world for all.